• Silver Linings • All the best bits in a nutshell! OMG! The Countdown to Christmas has already begun – and I’m super behind in blogging my best bits from November! This month has been pretty epic already, with so much going on it’s been a challenge getting in the odd early night and peaceful day but, as the song goes, ‘It’s the most wonderful time of the year!’ With so many great things to share, I better get stuck in . . .
I’ve reopened my NotOnTheHighstreet.com and Etsy shops! It’s been really lovely to have orders coming in and lots of lovely customer feedback – thank you all for your support, you have made my month! As y’all know I’ve been working on some new products and new branding – here’s a sneak peek of the new iPhone cases I’ll be launching online in the very near future. . . I’d love to hear what you think! 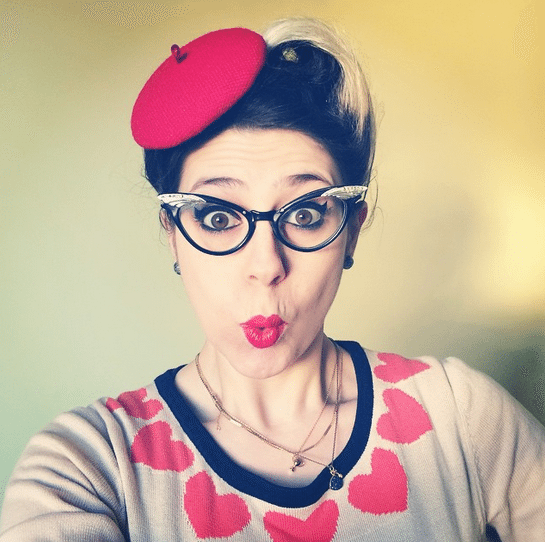 As you’ll see from today’s fun picture, I got my hair done by the lovely team at Lipstick, Lashes and Locks and I am having the most fun ever wearing my new Hello Strumpet hats with it! Pin Up hair has got to be my favourite thing ever, I always feel so great when it’s in Victory Rolls – plus being able to keep it up for a couple of days makes it totally worth the effort. I never want to take it down! Miss West End Girl, Wardrobe Conversations and I met for a girl date adventure which involved a tasty brunch, a wander around the Scotland Re:Designed pop up shop in Ocean Terminal and a round of hot chocolates in Panda & Sons… the perfect way to spend a winter day with my favourite ladies! I popped into YUU Beauty and Sobo Hair salon to get an Aveda facial and a little bit of pampering. Being non stop doesn’t mean not making time for being nice to my skin! If you have a lot on this month, I recommend you schedule yourself a nice wee treatment too, you wont regret it. I met up with Andrea from Zomato, a great new restaurant review and recommendation site which is taking over Edinburgh and helping me choose where to go eat with my besties. It’s about time too, I’m the worst at deciding where to go! The Christmas Snail Mail Trade is now in full swing with everyone paired up and picking out prezzies for their new secret partners! I can’t wait to see what you all send one another, the first one I did went so well I’ve got high hopes for this one surpassing it! I dropped by Godiva’s late shopping night and got treated to lots of yummy mulled wine and a discount on everything in store. There are so many great designers selling in the shop it’s a great place to pick out gifts and maybe even a couple of treats for myslef. Ooops! And last, but not least, I’ve been watching Eerie Indiana, a Nickelodeon show I was obsessed with as a kid and I have to admit, I’m still pretty impressed by it today. How come kids shows aren’t this great anymore? You can watch my favourite episode here (of course, it’s got a 1950s twist to it, naturally!) If you have any throwback shows that are worth watching online in my downtime, I’d love to hear about it! Shoot me a comment at the end of this post and share the love . . . So, overall, the month has been busy but brilliant. The blog might have suffered a little from my busy schedule, but now the pop up has closed doors and the snail mail trade is under way, I’m looking forward to getting stuck back in to hanging out with you all! December brings a visit to the Cambridge Satchel Company’s pop up shop on George Street in Edinburgh, a tea party at White Stuff and hopefully a wee visit to Dundee if everything goes to plan . . . well, we’ll see! How’s your December going? Any recommendations on fun things to do in the run up to Christmas? Roll on tree decorating and gingerbread men!